As a service to Bedford/St. 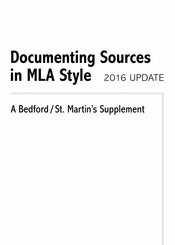 Martin’s customers, Macmillan Learning is pleased to offer Documenting Sources in MLA Style: 2016 Update. This brief supplement distills information from the MLA Handbook, 8th Edition, and can be packaged at no additional cost with any Bedford text.